Happy Mother's Day! 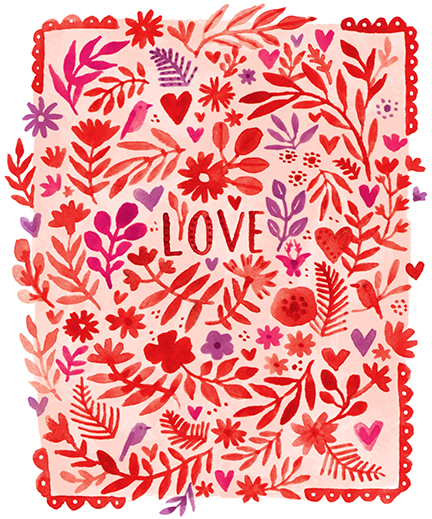 To celebrate, here's a free greeting card download. The file is set up with crop marks for cutting -- if that's new to you, this video tutorial is a terrific help. The latest issue of Taproot Magazine is out, including my cover illustration! There's some terrific articles in this issue and I'm itching to knit the included shawl pattern. Random asides, I have a braided rug like the one pictured (made by my grandmother), own a plaid winter jacket as shown (albeit grey), but have regrettably never lived anywhere with a fireplace (life goals). I've decided winter 2018 is going to be slow. I usually jump into the new year with guns blazing and a million ideas at hand. But this year I'm shifting gears. I decided January would be about completing old projects, finishing what I start and settling into a quieter, less frenetic time of year. 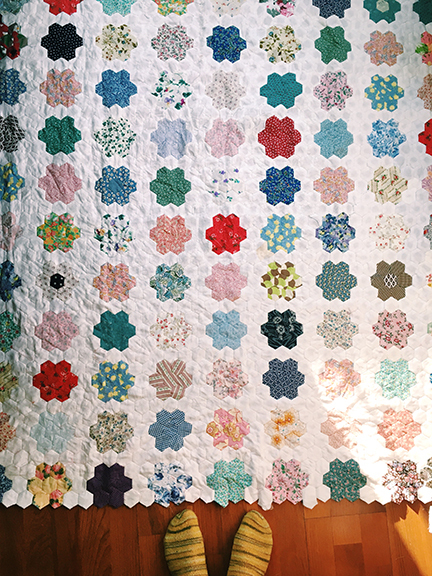 So in keeping with that, I've pulled out this quilt. I've been working on it since high school and this is the year it'll get done, fingers crossed. I'm only a few rows away from having it large enough for a twin size quilt and I figure if I add at least one rosette a week, it'll be done by the time 2019 comes knocking.
.* I'm on a Sidney Bechet kick as of late. I think he's the perfect antidote to January's greyness. I could listen to his cover of "The Blue Room" on continuous repeat all day. *And I'm over the moon to be illustrating Taproot Magazine's 2018 covers. I've been a huge fan of the magazine for ages and it's a dream project, for sure. Christmas was splendid and New Year's was lovely. I ate an inappropriate amount of cookies and wore pajamas until noon, so basically the holidays were a home run in my book. But it's back to work this week, although I did sneak in this sketch of Alice White as a warmup today. I burned through Granite Flats over the holidays and basically now all I want to draw are cold war spies and technicolor dresses. * I'm working on a couple new projects that are a change of pace for me and that I'm over the moon about. One, I can share about this month (stay tuned) and the other sometime this spring. *Mama's Belly by Kate Hosford comes out in April. * And Anne Arrives by Kallie George (an adaptation of Anne of Green Gables) will be here in the autumn! Aside from that, I'm planning to finish the Queens of England project I started last year (I'm up to the Stuarts), work on some new embroidery pieces, start a book dummy I've been thinking about forever and restock my shop. Nothing earth shattering, just plenty of staying the course. * Last year's resolution to read less (but longer) books was worthwhile and I found I wasn't just burning through things for the sake of an arbitrary number. So I'm planning to read twelve books this year and anything beyond that is gravy. * I'm going to keep going with previous years' resolutions to sew more of my own clothes. My wardrobe has a lot of staples that I've sewn over time, and I'd like to continue to keep that trend going. * And I'm headed to Ireland! The motherland! Finally! Any recommendations for the Galway area? Pubs? Fabric shops? What have you? Please and thank you. Happy holidays! 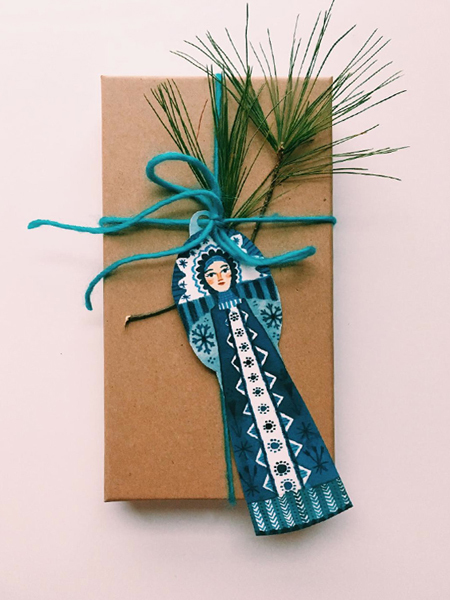 Below is a link to some gift tags I made, inspired by the Snow Maiden folktale. You'll need a PDF reader to open these. Before printing, I recommend adjusting your printer settings so that it's at its highest output quality (especially if you choose to run these on card stock). Feel free to print as many as you like for personal or educational use. Enjoy! And a belated Happy Hanukkah, a very Merry Christmas and a season of peace and joy to you and yours! It's snowing like mad outside and I've got some gingerbread to bake, so I'm off to go revel in the season. Something I picked back up this month, to work on during Open Studios. Speaking of which, the weekend turned out splendidly and it was wonderful to connect with so many delightful visitors. If you came out, many thanks! * I've just received a new batch of tea towel fabric, to replace what I sold at Open Studios. I'm working on sewing those up, and will put them in the shop as they're available. If you're looking for a print quickly, my Society6 shop is probably the speediest (and most economical) way to go. That's that I think? November is fading away, but it's been a good month. Thanksgiving was lovely and quiet and I redeemed myself in the pie making department (after a slew of disastrous crusts). I'm just about done with Spies in the Family and the last episode of George Gently was a solid, well-written series send-off (warning: spoilers in the link). I've given up convincing myself I can get by with sweaters and stubbornness, resigned to the fact that it's winter coat season. And I'm chugging away at two exciting new projects, that I'm looking forward to sharing in the new year. So that pretty much sums up the eleventh month. Now on to December! * If you're local, I'll be participating in the Artists of Salmon Falls Fall Open Studios next weekend, November 18-19. I'll have prints, original artwork, tea towels (the above design), embroideries, books and an assortment of other goods. The mills open studios are a terrific event and if that's not enough of a come on, Rollinsford is also home to the splendid Black Bean Cafe and North Country Hard Cider, or you can drive over the river to Thistle Pig in South Berwick. In short, you can make a day of it in these here parts. * I'm sewing tea towels and will have those available online within the next couple of weeks. Want to make your own? I've made the fabric available in my Spoonflower shop. One fat quarter is all you'll need for a tea towel (or you can fit four per yard). * I'm working on getting prints ready for my Etsy shop. I also sell prints, greeting cards, phone cases and other things over on Society6. Speaking of phone cases, I ordered this one from my shop and really, really love it. I feel like humming the Poirot theme every time I whisk it out (full disclosure: my ringtone is actually Doctor Who).And I think that's that (for now). UPDATE: I'm waiting for a shipment of paper and ink that's due to arrive Monday, November 23, after which I'll be able to resume print sales in my Etsy shop. Apologies for the inconvenience! 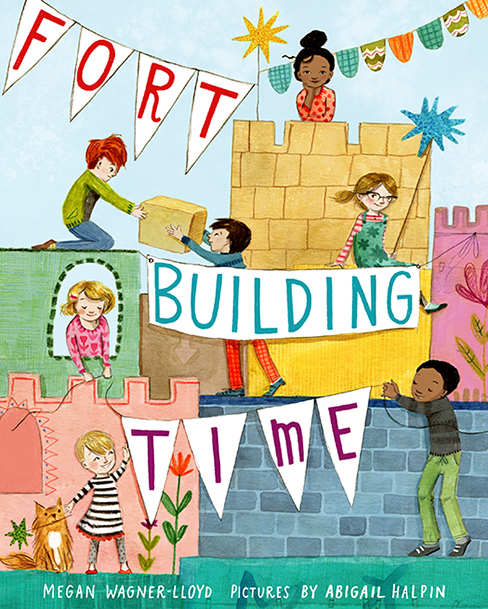 I'm excited to share Fort Building Time is out! Written by Megan Wagner Lloyd and published by the nice folks at Knopf Books for Young Readers, the story was a delight to illustrate. And many thanks to editor Julia Maguire and Nicole Gastonguay, for top notch art direction! 1. Leave on a comment on this post any time between now and 11:59 PM EST November 7 to be entered. 2. Open to residents of the United States and Canada, age 18 and over. 3. I'll choose the winning entry randomly, using this tool. 4. The winner will be announced on this post, November 8 and will be contacted via email as well. Thank you Blurb Books for sponsoring this post! 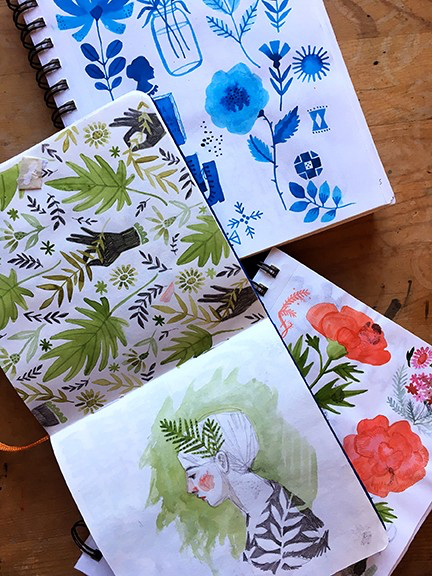 It's no secret that I love sketchbooks. A lot. And as someone who's been keeping a regular sketchbook since high school, I have stacks of the things around. A few months back, I decided to put together a book of my sketchbooks, to have handy in one volume a smattering of all those drawings. So when Blurb recently offered me a chance to create my own book through them, I immediately jumped at the opportunity to make the sketchbook idea a reality. If you're not familiar with Blurb, they're a terrific company that allows you to create and print your own books, magazines and eBooks (as well as sell the end result in the Blurb Marketplace, Ingram, or on Amazon). 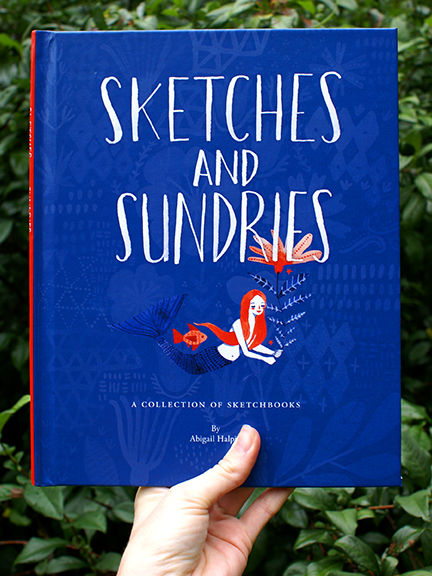 Sketches and Sundries is the book I made with Blurb, a hardcover volume full of sketchbook images from the past few years. I'm over the moon with the way the book turned out — Blurb's quality is top notch. The Premium photo paper I used for the interior pages is the stuff of dreams (speaking of which, the paper swatch kit is a big help in figuring out paper stock). And the colors! I'm blown away by the vibrancy of the images and my artwork reproduced beautifully. To design the book, I used the Adobe InDesign plug-in available from Blurb. I've never worked with a plug-in before, but it turned out to be straightforward and well worth the time. The plug-in integrated with InDesign to set up my document to spec, so there was no guesswork on my settings or about output for print. If you've got a basic, working knowledge of InDesign, you should be good to go using the Blurb InDesign plug-in (and if you need some extra help, I'd recommend the help page and video tutorial). 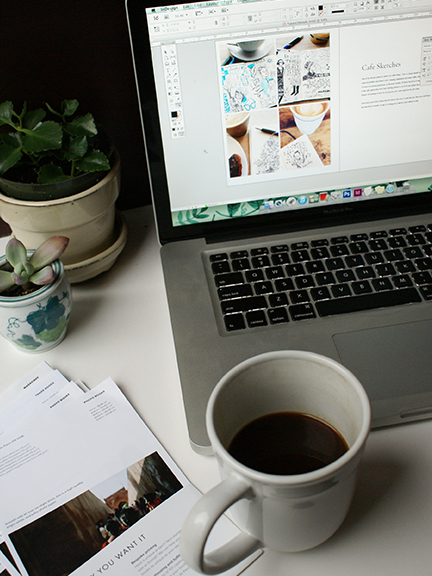 But if InDesign isn't your cup of tea, Blurb does offer BookWright, its own layout tool that's free and easy. I had a terrific time making this book with Blurb. Having the opportunity to go through my old sketchbooks gave me the chance to think about the illustrations I've made and the things I'd still like to draw. Invariably, there have been plenty of ideas I'd forgotten about in those sketchbook pages that I'm ready to bring to fruition. And among those ideas would definitely be more books like this. I've been mulling over the idea of making a book of portraits or even a one-off magazine. I’m excited by all the possibilities and plan on diving back into those sketchbook pages, to see what future projects are waiting inside.